Last week, as the new government were being sworn in, Infrastructure New Zealand (INZ), the lobby group representing infrastructure builders and financiers, were holding a conference about …. infrastructure. Unsurprisingly, INZ and many of their members have been some of the strongest supporters of the previous government’s massive road building programme and from reports were quite glum last week. INZ are also the group that said the $4-6 billion harbour crossing wasn’t big enough so pushed for it to be linked to the reanimated corpse of the eastern motorway. They’re also the ones recently shot themselves in the foot by comparing one of their favourite projects, the East-West Link, to a corruption ridden project in Russia. But they did have some advice for the new government. The new government has been told it must not chop and change practices to have any hope of meeting ambitious development goals set for New Zealand in the election campaign. Contracting companies at a conference organised by Infrastructure New Zealand said consistent policies would contrast with years of politically motivated flip-flops that often left businesses high and dry. The comments at the conference – which started in Wellington yesterday – came on the day the new government was sworn into office pledging to electrify rail and build 10,000 houses a year. Infrastructure New Zealand said more development like this was a good idea. But chief executive Stephen Selwood said for that to happen, New Zealand had to put politics-based boom-bust practices behind it, once and for all. “Projects are suddenly sprung up on the industry unexpectedly,” Mr Selwood said. “There is a boom while that goes through and suddenly there is no money or priorities change and the tap is turned off. Mr Selwood said to develop New Zealand infrastructure, companies needed to order materials, train staff and sign contracts long-term, and for that, they needed a secure pipeline of projects stretching into the future. But that was not how things were done by many companies in New Zealand. “They don’t invest for the long term, they gear themselves so they can ramp up staff as needed on short-term contracting methods, and then drop them off when the bust comes through. I think it’s more than a bit disingenuous to infer that the new government’s focus is politically motivated but that the previous government’s infrastructure policies weren’t. In some ways, I think we’re seeing the pendulum swinging the other way to the degree it is, simply because it was so hard to get even good urban transport projects off the ground. As to the main point, I don’t disagree that a steady pipeline of work is a good idea but this isn’t a new issue. I suspect that is in part because of the piecemeal way we tend to build infrastructure, breaking programmes down into smaller projects that are each tendered out individually with no guarantee subsequent sections will actually happen. The desire for a pipeline of work, combined with the announcements Phil Twyford has already made about Light Rail got me thinking though, perhaps it’s time we looked at how we deliver these differently. City to the North Shore, upgrading the Northern Busway (which will likely be needed within 10-15 years). So how about we create a pipeline of work to deliver this light rail network over say a 10-15 year period with the idea of delivering say 5-10km of the network every few years? Most of the first section from Wynyard Quarter to Mt Roskill is also apparently fairly easy to consent as is within the existing road corridor so could help in getting it underway relatively quickly while planning work works though other sections. There are obviously plenty of other projects that need building over that time frame too, but having a steady programme of work churning out planning and then delivery of light rail every few years sounds exactly what the infrastructure industry are after. If we really want to be a bit bolder, we could even tie in the construction of housing so that as vastly improved transport options are created, we also increase the number of people who can access it. I just want to question light rail to Huapai and Waimauku in your map above. If Winston spruces up the Northern Rail Line as promised, it is possible both centres will have a HR passenger service. I am a little concerned that both those locations will have LR and HR which is great if one service has a breakdown but wasteful in capital spending. No problem with having LR end at Kumeu where it can join HR on the Northern Line. Most people would use the LR service because its much faster and more direct or connects better to transferring services. Journey to work suggests these areas mostly work in Westgate, the North Shore and the City Centre not Henderson. This is perhaps the most telling thing. The industry is clamouring for a forward programme of works, because at the heart of it the RoNS were are corporate welfare scheme intended to keep the economy ticking over by keeping the large construction firms in regular work. That fact that most of the RoNS were economically bad as transport projects wasn’t the concern, they were politically effective ways to pump the industry. So the trick now is to keep that steady pipeline of works going, but to make then projects that are actually economically efficient and effective for the long run growth and development of Auckland, and the nation. So indeed, a light rail scheme of five or six billion dollar stages spread out over ten or fifteen years, that will keep things happening nicely. And instead of multi billion dollar mega-project rural motorways, why not a steady programme of say $400m a year, every year, to steadily convert state highways into three or four lane divided expressways and build bypasses of the worst bits. For example, we probably could have had a bypass of Warkworth and four laning of the highway to Wellsford already, if they had decided to improve the existing rather than plan for a duplicate motorway a kilometre west. I agree. Traveled by bus from Wellington to Hamilton last week and State Hwy 1 through the central North Island is in a shocking condition. It seems that NZTA is doing bandaid fixes. Asked our bus driver what his thoughts were on the the road conditions, his comment was there needs to be serious work to upgrade the road especially since the previous government had allowed heavier axle loads for trucks which is causing the current roading conditions yet didn’t upgrade the road for heavier axle weights. definately agree with that, the next batch of rons included duplicate highways where upgrading existing roads and town bypasses would have been a better idea. Otaki springs to mind. steady programme of $400m instead of multi billion dollar investment is A+, couldn’t agree more for our roading infrastructure. However we need multi billion dollar investment into our public transport network so it can catchup from the under investment it has had. How about a project of works that 3 lane splits the CNI? Waiouru to Tamahere / Taupiri? 2 lanes North 1 lane South, 2 lanes South 1 lane North. This way local / regional traffic still has access but Auckland / Waikato, Wellington / Manawatu through traffic have the option of travelling on a 2 lane highway north through Taumaranui and south through Taupo – or vice versa. Auckland to Cambridge 4 lanes is already happening, Wellington to Levin likewise. would be easy to do this 3 lane split from Levin to Hunterville via Bulls and Feilding too. Would just leave a difficult 75km through Taihape to connect Auckland / Hamilton to Wellington Palmerston North 2 lanes. Zero interest in pandering to the needs of private business that profit at the expense of the public. Markets change and if you aren’t ready, that’s your problem. No one is here to guarantee you a job. The main problem is that we could have a returning National government in 3 years to undo everything. No such thing as long term pipeline for trams under those conditions. The teams working on EWLink no doubt are a bit bummed that all their work is probably wasted for a while because of the new government. This stuff happens when you take a gamble on the future. Only one or two new lines over the next decade seems somewhat leisurely in a city that is so starved of public transport infrastructure. Perhaps Infrastructure NZ should be lobbying for a faster and more comprehensive light rail programme, and if they are after continuity then maybe they should also be lobbying the opposition in favour of the same. Yes, could be more ambitious with it…then again they are big lines & plenty of other projects happening (* cough, or should be happening) too. AMETI, Skypath, Seapath, bus lane & New Network roll outs. In ten years we would have three heavy rail, two light rail, and two bus rapid transport corridors. That seems pretty good for 1.5 million people. How many does London have? In terms of light rail, they have Tramlink and the Docklands Light Railway. London is interesting, but a more aspirational target for a similar sized city is Vienna. Their public transport is so good that only 27% of journeys occur by car. We often look to English speaking countries for comparison, but often non english speaking countries do it way better. I spent some time living in Hanover, Germany. With the S-Bahn (heavy rail) U-Bahn (light rail / trams, partially running in tunnels), buses, and ICE (high speed intercity trains) it should be the aspirational model for Auckland. I remember getting off the U-Bahn and my bus would always be sitting there on the other side of the road, waiting to take me home. It was all so easy. It all just worked. The population of Hanover is roughly the same as Auckland. Vienna is about twice the population of Auckland. ..and don’t forget, more broadly, Regional Rail projects as well. Simon, the net shows Auckland with an urban population of 1.5 million and Vienna 1.7 million. I think its about right with the current congestion free plan, they just need to cement some dates (procure the works, sign some contracts) so we can gear up. No more delays please! Businesses are coping fine, I guess the industry are merely putting forward their wish list. As with any business, training personnel is a large cost. However once you have trained personnel in house it makes these projects more cost effective than using temporary staff or contractors which have their margins built in. Also trained and experienced staff will ensure better productivity. Its better not only for the industry, but also for the tax payer forking out the bill, to have a secured forward workload programme. It also offers security for property investment and development along certain corridors and in certain areas for example light rail down Dominion road will increase livability and enable increased density living. The biggest beneficiaries of having forward workload however is the temporary labourer’s and personnel who will be up-skilled, invested in and gain secure employment. A lot of construction is using temp staff, which results in the actual employee receiving less than they are worth as the temp companies clip the ticket. The nature of having 3 year governments is priorities and investments change, and therefore companies have to price and gear for these, the extra cost of this risk falls onto the taxpayer eventually. I cant see this changing. Ari, Salvador in Bahia, Brasil seemed to come up with a novel plan to counter a change in government. They started various parts of their metro simultaneously. If there had been a change in government there may still have been a strong inclination to join the dots to have anything that worked. Infrastructure New Zealand’s complaints about a lack of a pipeline of work are horseshit. Treasury regularly publishes its infrastructure stocktake so the whole of the public sector can see what is required in future years across multiple disciplines. The major public utilities like Watercare and Auckland Transport, and Christchurch Council, all publish asset management plans in which the major work requirements, the years they are required, and the approximate budgets, are all laid out in black and white. The other Councils and their entities all do similarly through their Long Term Plans and Annual Plans. And of course the grand-daddy client of them all – NZTA – publishes the NLTP and RLTP line by line after extensive public consultation. What is also on the public record is the Labour-Greens proposals for light rail and for heavy rail. INZ just needed to read the multiple releases and speeches that they have both put out for nearly a decade to prepare for changes to the industry. What INZ is showing that the industry collectively lacks, is the intelligence to analyse the policy and political information that is there to prepare their marketing and business formation programmes with greater sophistication, and to have the foresight to gear their capacity up for a change in policy direction. There is no way you can rely on most of this data, if when the government changes, they are able to change the ‘pipeline’. You can rely on about 3-4 years worth only, that’s not a lot of time for investment in staff and equipment required for many of these projects. Good example is you pointing out the Labour – Greens plans. This has only eventuated because they won the election which could of gone eitherway until Winston Peter made the decision. Heck the polls were indication National led government was more likely. If Labour/NZF hadn’t won we would be building the east-west roading link, instead of light rail. Two completely different projects, which require different skill sets. Remember a lot of these projects are very specialised, for example, someone who is trained in tunnel trenching cant necessarily jump into tunnel boring without re-training. Of course they are exaggerating the impact, but don’t blame them for putting out their wishlist. Having a secured workload will also benefit the taxpayer with cost savings, and employees with secured employment and upskilling, rather than companies using temp staff and contractors. At the moment the risk of employing and training more staff is not worth the risk of project priorities changing, and therefore we rely on the middleman. Policy information is not like Tenderlink. So yes it is less stable. But if you simply write it off because it’s too hard to interpret, you end up in the current situation. I’d agree that planning a workforce on the back of a manifesto is hard, but seriously it was going to be one side or the other: that’s the time you actually strategise with your senior team that there’s a pretty high risk that the government will change and alter your business planning accordingly. Your example of tunnel trenching and tunnel boring is worth comment. The industry knew for many years that Waterview was on the cards. The industry reacted the right way through an alliance that included NZTA. The issue of City Rail Link, Central Interceptor, and others, also very well predicted, unless you were living under a rock. The issue of tunnelers specifically is one of those skill areas that has such high demand globally that people get poached off jobs from Hong Kong to Auckland to Melbourne in very short order. All that tells me is market failure of training and of companies to invest in them long term, and in turn tunnelers command a global premium. It also means that global firms will likely win more jobs against local NZ firms, since small NZ firms cannot often afford to sustain such specific skills. They simply won’t be able to bid by themselves. That’s a basic reality of our market. Yes, McConnell Dowel have huge experience in this aspect. However when it comes to major (people carrying) tunneling even our most experience require overseas expertise. Its not that we don’t have the technical nous, but that we don’t have the construction management experience and training for projects of this scale. Training is hugely expensive, its less risk to import the skill, rather than upskilling in-house. Mind you, the construction manager for CRL is a local, from Kelson Boys. Waterview is a perfect example where, instead of using Labour Hire, semi skilled sub-contractors and skilled international contractors, NZ Contracting companies could have invested in their own personnel if at the time CRL had a confirmed start date and had the harbour crossing tunnel had been confirmed after CRL. If we had a forward workload like this confirmed then NZ Firms would have been able to afford sustaining these specific skills sets. But as you say, with the reality of the NZ market, changing timelines of projects and re-prioritisation of infrastructure projects due to changing governments, we are unable to form this project roadmap with confirmed start dates on projects, and therefore the market is too risky for contracting firms to undertake the investment required. Hence they are short term focused and have to rely on importing expensive contracting experience, labour hire teams and inefficient subcontractors (due to lack of experience and training) on these projects. This in turn increases the cost and timelines. However this is not one that is easy to change, as each government will always have different priority infrastructure projects. Unfortunately this means it will always cost slightly more for the tax payer, and will always create slightly less stable employment for people within the industry. Having published works programs of what was coming up used to be standard practice in infrastructure agencies and does make sense. If you look at US, Canadian or French cities that have built LRT networks it has taken then 10+ years. The first stage will be the slowest because it will require building a depot, commissioning rolling stock and training staff. Say 3-4 years. The airport extension will also need 3 years due to the bridge over Manukau Harbour. After that 3 years a stage would allow designing, building and commissioning new lines. So you could say Mt Roskill year 4, airport year 7, north west year 10 and north shore year 13. Things could be sped up if overlapped. If they want a pipeline, let’s fill that pipe! I discovered a post from 2014 advocating a spur line to Mount Roskill from Avondale, that has since been dropped from the Congestion Free Network plan. Can we resuscitate this or is there an irresistible force countering it? I still believe an Avondale to Onehunga line is a good idea, not as a BRT, but as either Heavy or Light Rail. If they can have a motorway, why can we not have a tram / train? The more circular train services we can create the more efficient the system can become, and the less trains that have to pass through Newmarket, which the CRL will facilitate, the better also. With a Public Transport friendly government holding the purse strings after a decade of Funnelling to RONS, now is the hour to unleash and make it impossible to reverse, as they did to us with that Water (no) View (from a) Tunnel. The Mt Roskill branch in the original CFN joined the Western line at Mt Albert and headed towards the CRL. It had two stations along its route and one of them will now be at a point where the LR journey along Dominion Rd would be a quicker trip to the city so it’s a bit hard to justify building the line. Light rail from airport to Avondale would be good though, much quicker for people out west to change at Avondale than Mt Eden. If winstons plan to rescusitate the North auckland line is successful then that corridor may well be required to get freight thru the Auckland metro area. Does that conflict with light rail from Dominion Road to Onehunga? yes. It was set aside as a rail corridor 60+ years ago and using it as a freight bypass route to avoid the busy city commuter areas will be a good thing in the future. the original plan was for the rail line to go through the then being built state housing areas of 3 Kings, Mt Roskill, Owairaka, etc., letting people get to work at the factories in Avondale and Onehunga, as well as to go around the loop into the city for those with office jobs. It would certainly be good for those people, but I’m not sure the demand would justify building LR between Mt Roskill and Avondale, including finding a new corridor for part of it. I suspect we are talking busloads not tramloads. I think wait until the port study is done, then then some sort of Avondale – Southdown line probably may be needed. Is there room for both light & heavy rail between dominion rd and onehunga? Looks like about 2.5km of potential route conflict. I imagine a freight only Avondale to Southdown line would be ok with single track and a crossing loop midway. Sounds like a bit of destruction would go on to fit things, I don’t really know but have a rough sketch from a fellow blog commenter with the it drawn on roughly – I guess it’s fairly accurate but it leaves SH20 around Hayr Rd and wiggles through housing areas crossing the Onehunga line direcltly north of Waikaraka Speedway. Conflict is only between Dominion Rd & Hillsborough Rd, proposed LR follows motorway down the hill (rather than the SAL designation from that point). Port Study? not a parochial ‘where will Auckland put Auckland’s jewel’ study, but hopefully a North Island freight strategy first, with only one (or two?) import/export hubbing ports. After that study is done, we can see how Auckland can fit in. Meanwhile POAL’s owner (the Council) should be buying up shares fast in both North Port and POT ! We used to have a government department whose brief was to plan and build the underlying infrastructure for the country. Apparently many of the issues facing Auckland were scoped out in 1946. It also produced a well skilled workforce who could migrate into the private sector or start their own businesses and smoothed out the boom bust. http://www.stuff.co.nz/national/politics/opinion/86696197/chris-trotter-bring-back-the-ministry-of-works We used to just get on and do stuff. BTW there was still space for the private sector as we used to have what is known as a mixed model economy, not a communist one as many contend. Do any fellow blog followers think that a PPP/BOT approach would work as a way of providing a comfort zone for the infrastructure builders and getting the infrastructure in reliably and cost effectively for the community? There’s examples of PPP and light ral out there, such as GoldLinQ in Aus. Being from the UK I’ve seen PPP used loads but it never seems to be mentioned in NZ? Not my cup of tea. They just seem to shave off the lucrative parts and hand them over to private hands, or charge users a fraction of the cost, cutting out the poor and servicing the rich, while the bulk of the cost is still met by the taxpayer. A post about Australia’s PPP’s – the good, the bad, and the ugly, would be great. Ask Shane Warburton how many of NSW and QLD’s PPPs have fallen over completely. Exactly. Has GA covered this in the past? I agreed we should split a large project such as light rail into sections, and have them build in stages from city centre moving outward. That would ensure projects actually get started and progress being made regardless of political changes. 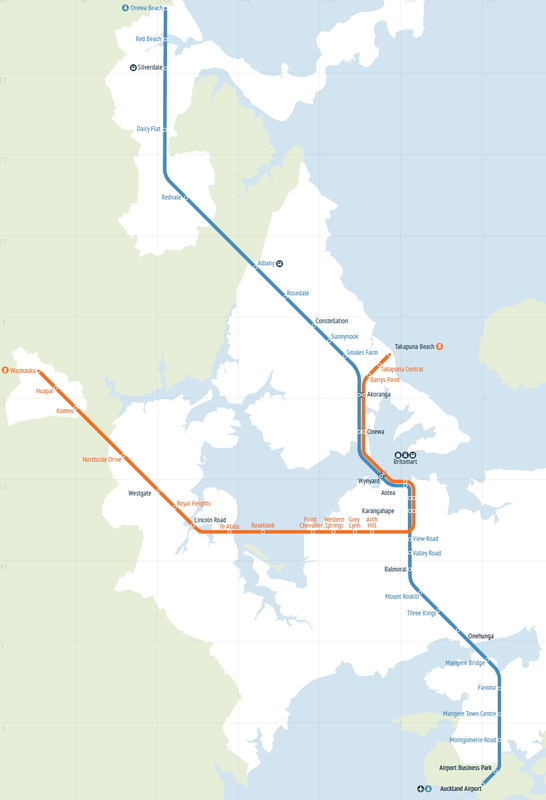 They could also build from Phuinui to the Airport and Mangere bridge while they are building the bridge over the Manukau harbour to Onehunga , it would help to get up and running faster and also use HR as a link from east and southern Auckland . Pipeline: make the pipeline bigger and longer by including other cities in the pipeline too. Wellington is brushing at the edge of being big enough for a Light Rail system – people argue it back and forward, but we are on the cusp. And our city is set up well for it too, with a clean run from the one big main Railway Station, all the way through to the Restaurants (Courtenay Place), Hospital (Newtown), and eventually Airport (Miramar). We need to be planning for it now, and installing it in about 5-10 years time. Which would be perfect timing for the AKL LR team to have finished their Dominion Road route, and then they can move down to Wellington – nice and orderly. It would also be a good idea to put in the orders for the vehicles now – get in the queue, as the waiting lists are getting longer. If both cities got their LR cars from the same supplier, that would probably also be a sensible point? A bus requires about 150kg per person if it is well utilised, the train is about twice that. A car would be about 1,500kg per person. I would prefer a four year election cycle. If Infrastructure NZ want to bid for the contracts they need to be able to adapt. They’re not going to be handed all the projects on a platter for years to come. I want the highest standard infrastructure outcomes for New Zealand, not corporate welfare. Bid competitively and I’d like you to get the work. Given how long it takes NZ to deliver infra projects (decades), the shorter electoral cycle is worth mentioning. How much traction are we going to get on LRT in the next three years before another Govt gets voted in and puts the whole thing on ice? Would it be useful to set up a NZ Light Rail government entity? It seems Airport to Wynyard is a certainty and will be the first light rail project in the country. The NW LRT seems highly probable and their extension to Takapuna and beyond long term likely. Building on that body of work an organisation could then focus on a Wellington light rail project, Auckland BRT retro fitting and possible projects in Christchurch and Tauranga, maybe even Hamilton and Dunedin. This could all be coordinated at a national level with a core of light rail expertise, NZTA? and the relevant local government(s).